Stop Nurse Burnout – the book is LIVE! 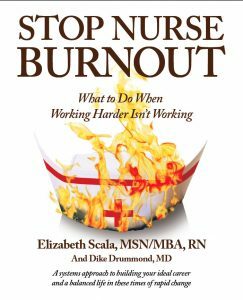 Stop Nurse Burnout – the book is LIVE ! The unique nurse-doctor collaboration story behind how the book “Stop Nurse Burnout – what to do when working harder isn’t working” came to life. As I often do when approached by strangers on the internet from out of the blue – I did my homework. I reviewed the email, his website at TheHappyMD.com and all of the documents very carefully. 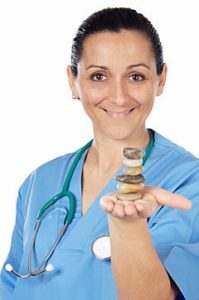 I took my time and even checked out the other nurse burnout experts that he referenced in the email – these were people he had considered for this out-of-the-blue offer of collaboration and chose me instead. I was interested and my curiosity caused me to respond. I was open to talking and hearing more about the vision that this doctor had about stopping nurse burnout. It was immediately clear he is an expert on dealing with physician burnout, but why reach out to create a resource for nurses? Well over time and several conversations, one thing led to another. Dr. Dike Drummond and I entered a partnership. I was already on a mission to stop nurse burnout and his parallel journey to stop physician burnout made sense to me. Dr. Drummond’s success with helping physicians with similar struggles was encouraging – and as a nurse who suffered burnout myself – I saw this project as a win-win-win. Nurse burnout is a terrible issue affecting thousands of nurses worldwide. With my own burnout wounds freshly healing at the time, I received Dr. Drummond’s offer as an exciting opportunity to help even more of my fellow colleagues. And working with a physician who ‘got’ burnout and wanted to help nurses just as much as he did doctors – this was looking like it might be the project of a lifetime! So here we are about a year and a half later. Multiple phone meetings behind us. Hundreds of emails back and forth. Revision after revision of his ground breaking book Stop Physician Burnout, incorporating his lessons learned with hundreds of physician coaching clients to produce our co-authored book Stop Nurse Burnout. Gosh, we even met one time in New Jersey, while Dr. Drummond gave several burnout prevention talks to physicians and administrative staff. We are thrilled to announce the launch of this brand new website www.StopNurseBurnout.com which is full of burnout prevention tools specifically designed for nurses. And of course, our Stop Nurse Burnout book itself is hot off the presses and available both from this site and on Amazon.com — ready to teach you how to lower stress, build life balance and build a more Ideal Career. Dr. Drummond and I are building live trainings, a coaching programs and other supports for burned out nurses using insights from his 1800 hours of one-on-one coaching with physicians and his experience training over 10,000 doctors in live settings since 2004. This is shaping up to be the project of a lifetime indeed! Put burnout behind you once and for all. Use this book to STOP the downward spiral of nurse burnout with field-tested, nurse-approved burnout prevention techniques. Chart your course from Nurse Burnout to Your Ideal Career using this first comprehensive stress-reduction resource for nurses worldwide. Copyright stopnurseburnout.com 2018. Website design and development by Woodchuck Arts in Caledonia, Michigan.